My world through photography: Water Droplets - The winner is - A TIE?!?! Water Droplets - The winner is - A TIE?!?! My cast came off yesterday, which is nice. I will still be in a boot though until the end of the year. Even so, it's nice to be out of the cast, able to remove the boot and relax. 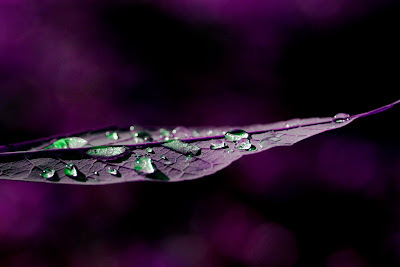 Now on to photography, I posted last week some water droplets on a leaf and put it up to a vote for favorites. Well, there was a two way tie. I plan to list the most voted on Etsy and Artfire. Here they are again. So, which one should I list?? Or should I list all three from the other day, these two and the blue one as a series? post them all... its like "pop art"
Diane, I'm glad you are out of that cast. To your question, I would post all of them. I like the first one the most right now. The color seems more natural. If I look at the photos again I might change my mind about which one I like the most. They're really too good to choose from.